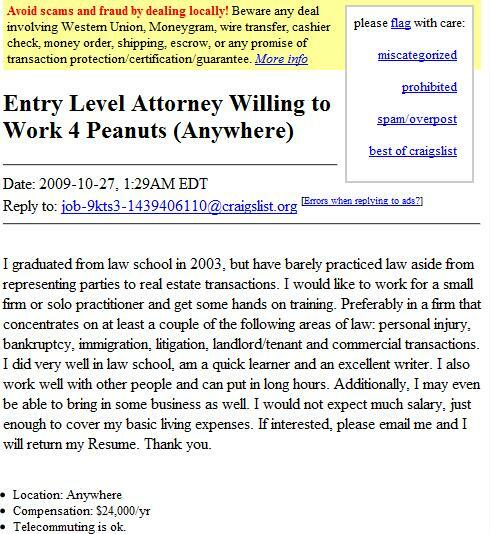 Is this what those seeking gainful employment in the legal industry must resort to? Is this what those who have a 4 year degree, studied for the LSAT’s, endured 3 years of law school, and sat for the bar exam must do to become employed? The sad part is this person will probably get no offers, even after willing to stoop to humiliatingly low levels of desperation. This does not bode well for the legal profession, no my friends it does not. Its realistic. The guy says himself that he has had little experience, and he says himself that he is seeking training. Unfortunately, some of us have done the whole training thing (and ok, we're always learning) but are still reduced to taking low paid or lower level positions to those for which we are qualified. This week I've been pondering whether or not to look for any kind of unskilled job to keep me going until I find a suitable position, because anything is better than the dole. I fear, however, that my chances of success are equally dire. Its not fair, its no fun, its just necessary.